Skilled, active, interpretation and evaluation of arguments, communications, information, and observations. Also test the subject's political affiliation to see if there is a positive correlation between critical thinking, open-mindedness, and voting for liberty minded candidates. What Does a Critical Thinking Test Measure? Critical thinking tests assess your ability to logically analyze assumptions, arguments, deductions, inferences and interpreting information. You will be given a passage of information which may contain a mixture of verbal and numerical data, and will be provided with a statement which requires the candidate’s critical assessment of how true that statement is based on the above passage. 1. Assumptions: In these questions a statement will be presented and the candidate will have to decide if an assumption has been made in making the statement. For example in the statement “only people earning a high salary can afford a fast car” it is assumed that fast cars cost more than not fast cars (this is just one of many assumptions implicit in the statement). An assumption is something someone effectively takes for granted. Statements are given for the individual to read and they are then followed by several proposed assumptions. The candidate has to select whether an assumption has or has not been made. 2. Analyzing arguments: Candidates will be provided with a given scenario i.e. “Should the government pay student’s tuition fees?” They are subsequently provided with a list of arguments for or against the scenario presented. The candidate will need to assess if each argument is strong or weak, based on how relevant it is and how well it addresses the question. The argument is considered to be strong if it directly relates to the question or statement, and weak if it is not directly related to the question or statement. 3. Deductions: Candidates will be provided with a passage of information and candidates will need to evaluate a list of deductions made based on that passage. If one cannot deduce a particular statement from the passage, then that deduction does not follow, and the candidate must select which deductions follow and which do not follow. The answer must be entirely based on the statements made and not on conclusions made from one’s own knowledge. 4. Inferences: In this section candidates will be provided with a passage of information on a scenario. A subsequent list of possible inferences will follow, and candidates will be asked to rate if they are true, false, possibly true, possibly false or whether it is not possible to say based on the information in the passage. 5. Interpreting information: A paragraph of information will be provided to the candidate, with a list of possible conclusions. Candidates will need to interpret the information in the paragraph and decide if each conclusion follow based on the presented information. Once again the decisions must solely be based on the information given. What Should you Know Before a Critical Thinking Test? If a critical reasoning test is used in the assessment centre stage of the recruitment process then it is unlikely that it alone will be the sole decider of the selection decision. Instead a mixture of tools will be used and combined to get a varied view of the candidate’s abilities. However if a critical reasoning test is used at the early stages of the recruitment process, it may be that this is being used as a screening tool, and poor performance may screen that candidate out at that early stage. For a critical reasoning test candidates will not be required to learn any specific material before the test and will not be asked to use prior knowledge. All the information needed to complete the questions will be provided in the test. Here is a list of critical reasoning tests on the market at present which candidates may be likely to encounter for recruitment, selection or development. 1. Watson Glaser Critical Thinking Appraisal: The WGCTA is the most widely-used critical reasoning test on the market, and the one candidates are most likely to encounter. 2. GMAT: The general management aptitude test (GMAT) contains sections which require the use of critical reasoning ability. The GMAT is used as an entry requirement into business schools, and tests a candidate’s ability to think critically and make decisions in a business setting. 3. SHL Critical Reasoning Test Battery: The SHL Critical Reasoning Test Battery is a collection of 60 critical reasoning questions with varying difficulty depending of the level of candidate. This test has a time limit of 30 minutes. 4. 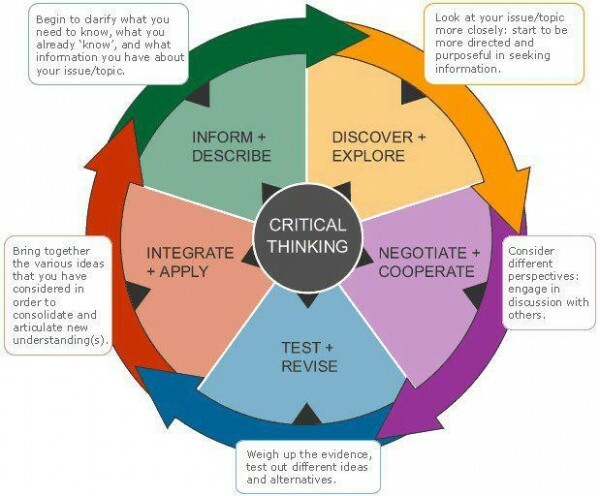 Cornell Critical Thinking Assessment: The Cornell Critical Thinking Assessment is a test primarily used in educational settings. There are two versions of this test, one for children and one for adults. This test may be used for entry onto particular degree courses or for recruitment/development purposes. 5. Verbal and numerical critical reasoning: Some test may specifically test verbal critical thinking, or numerical critical thinking. Similarly verbal/numerical reasoning test will employ critical thinking questions in their tests, or will have questions which may implicitly require the use of critical thinking. Here is some general advice to help you perform to the best of your ability for your critical reasoning test. 1. Only use the information contained in the test: When reading the passages of information within the test, your first instinct may be to use general knowledge or your own personal experience. Critical reasoning tests are not tests of what you think; they are tests of how you think. You will not be required to utilize any prior knowledge when answering a question, and at times the correct answer will completely contradict what you know to be true based on your own knowledge, but is true in the context of the passage. 2. Read the instructions thoroughly: Critical reasoning tests will require numerous separate types of logical reasoning, and reading the instructions will inform you of how to answer questions correctly. For example if a question requires you to evaluate the strength of an argument, the instruction page will inform you what constitutes a strong or weak argument. Take ample time to ensure you know how to answer questions regardless of any time limits. 3. Time limits: Due to the complex nature of critical reasoning tests, there will often be no time limits or there will be generous time limits. Candidates are advised to use this to their advantage and take plenty of time when reading, evaluating and answering. An easy mistake to make is treating this type of test like a verbal or numerical reasoning test and answering questions as quickly as possible. Rushing through a critical thinking test may lead to candidates missing key points, and answering incorrectly as a result. 4. Logical fallacies: Understanding logical fallacies is an important part of the test, and researching the difference between sound and fallacious logical can help maximize performance on a critical reasoning test. A fallacy is an error in reasoning due to a misconception or a presumption, and an argument which employs a formal fallacy, logical fallacy or a deductive fallacy in its reasoning becomes an invalid argument. Researching the different types of fallacy (i.e. red herring argument, straw man argument, confusing correlation and causation etc.) can help you identify then in the test and therefore answer the question correctly. Practice critical reasoning tests as offered are a useful method of preparation. Having actually undertaken a critical reasoning test before the real thing can be a great confidence booster, and help you to learn from your mistakes in the practice test. The best place to get advice on taking a critical thinking tests is the test publisher's website, for example this one for the Watson Glaser. By far the most common type of critical thinking test is the Watson-Glaser Critical Thinking Appraisal (WGCTA) which is published by Pearson Assessments. You can visit their official site here: Watson Glaser. 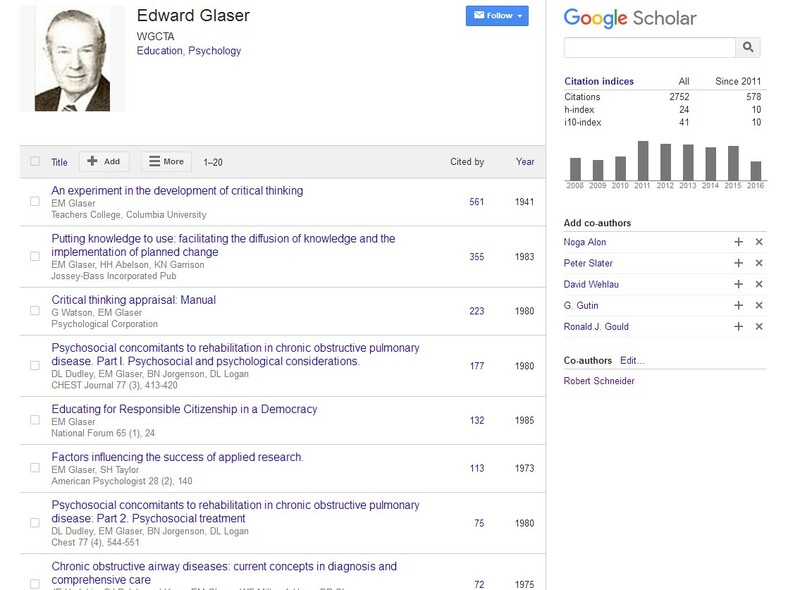 With over 85 years worth of development, the Watson-Glaser Critical Thinking Appraisal is the most popular measure of critical thinking ability. The test is most commonly used by law firms, which is understandable as the abilities measured by the WGCTA are good predictors of future success in roles which require clarity of understanding from multiple perspectives and the ability to reason with fact versus assumption. The Watson-Glaser Thinking Appraisal (WGCTA) is one of the main evaluating tools for cognitive abilities in professionals, since it measures critical thinking. It is seen as a successful tool to predict job success, as well as being used to select good managers and finding future possibleEdward Glaser leaders. It is also used in order to select the right person for a specific job role, especially for careers in the law. 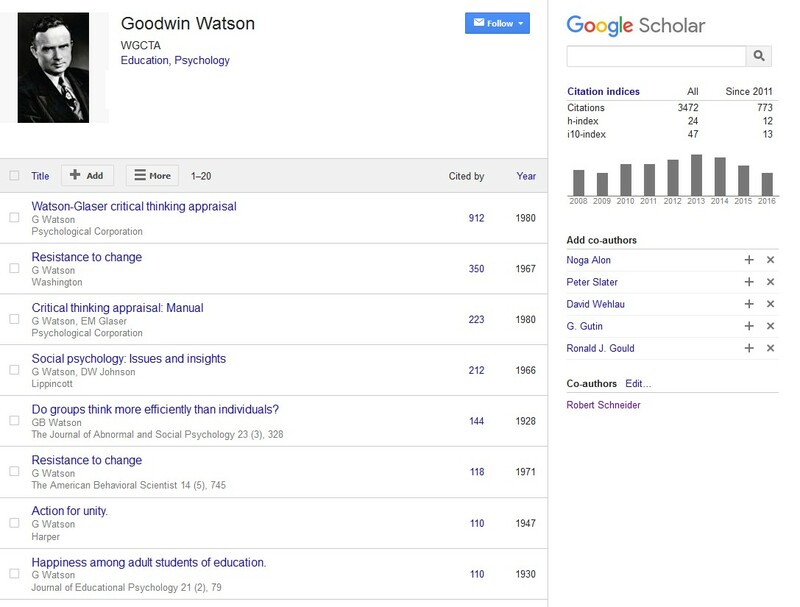 Goodwin Watson notes milestones in his life and career, including his PhD in educational psychology, attendance at Union Theological Seminary, and joining the Columbia University Teachers College faculty. During 1925-1942, Watson earned the reputation of being not only a thoughtful activist and innovator but also a scholar and researcher. After World War II, he became chief of the Analysis Division of the Foreign Broadcast Intelligence Service, but within two years was forced out of office as a "disloyal citizen" by what was then known as the Dies Committee. He had gone to the Soviet Union and to Nazi Germany and had reported on features of their systems, including educational, that he considered promising. He held a professorship at Newark State College until 1970. In 1963, Watson and James P. Dixon were founders of the Union of Experimenting Colleges, an outgrowth of which was the creation of the University Without Walls. At the later stages of the recruitment process companies are unlikely to base their entire selection decision on a single score on a single exercise. Instead recruiters will use scores from numerous measures and made a balanced decision based on all factors. Critical thinking tests are used to measure a candidate's fit for a role, so being rejected after taking a test means that the role is not a good fit for you. If you have been invited to undertake a critical reasoning test then the organization clearly has an interest in hiring you, let that fact inspire confidence and perform to the best of your ability on your test, good luck!